If you've started cleaning out your cupbaords and fridge to begin a sugar free lifestyle, then you know you've got to restock those cupboards with healthier options. Having on hand some staples like coconut in different forms is a good idea! I use a variety of coconut products in many recipes. Shredded unsweetened coconut works great in no bake crusts. Coconut milk works fabulous in smoothies and other desserts you will see below. Coconut oil is very healthy and perfect to sub butter in recipes for dairy free options. All these recipes below use coconut in some form so be sure your pantry is stocked so you can start cooking and baking sugar free! 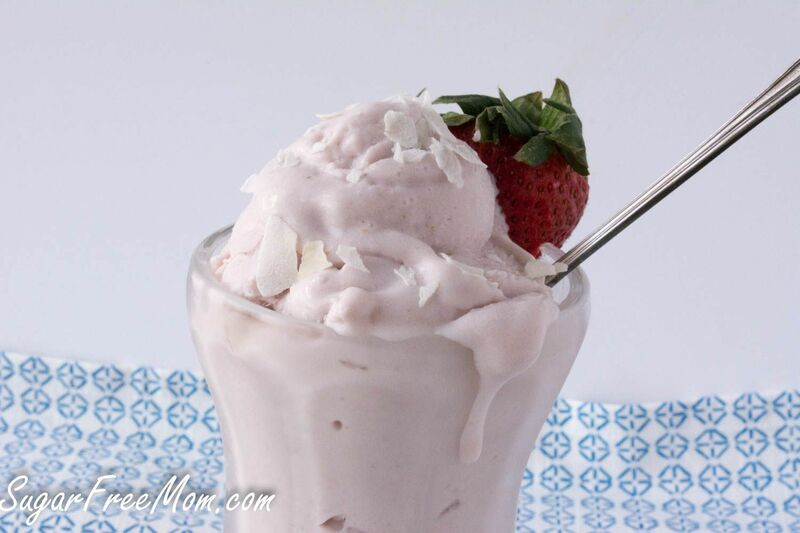 An easy low sugar strawberry frozen delight! This indulgent candy bar is not only delicious, but low carb and sugar free! An easy no cooking dessert! These moist, yummy cupcakes are low carb sugar, dairy, and gluten free treats! Cream filled cupcakes made healthy has never tasted so good! These sweet little macaroons are a delicious guilt free dessert! Dairy free, creamy and super easy to make ice cream, no eggs needed! These easy, fudgey brownies use healthy coconut oil instead of butter! This irresistible white chocolate coconut fudge will have you coming back for more! Who needs all the added sugar when you can make this magic shell with only 3 ingredients! This decadent gluten free cheesecake uses shredded coconut in it's moist and delicious crust! This easy and flavorful dish is a fun way to bring coconut to the dinner table! No more watching people enjoy milkshakes from the sidelines, this luscious shake is dairy and sugar free! This light coconut lime cheesecake with no added sugar is a perfect summer dessert! This dairy and gluten free coconut flan uses yummy coconut sugar in the decadent caramel sauce! These grain, gluten, and sugar free no bake bars have a creamy, luscious cheesecake layer on top of a crumbly coconut crust! Grown ups and kids will agree that these sugar, grain, gluten, and dairy free chocolate cookies are amazing! This fantastic, moist pound cake is made low carb and is grain, gluten, and sugar free! These light and creamy no bake truffles are the perfect summer dessert to share with friends!